Hagabion is an independent cinema located inside the great Viktoriahuset along Linnégatan, near Järntorget in Gothenburg city. The cinema is part of the classical ​Folkets Bio​ Movement (”The People’s Cinema”). A network consisting of 20 cinemas in about the same size, spread all over the country, all of them working towards the same goal ever since the national organization of Folkets Bio was established back 1973: promoting non-commercial movies, alternative expressions and new perspectives in the art of cinema. Creating an opportunity for those voices who normally don’t reach out to a broader audience by offering a unique platform for filmmakers and distribution of their films. Hagabion is running thanks to our 100+ active members, who are voluntarily screening the movies, selling tickets and introducing the movies on a weekly schedule. As well as doing all the other important, daily tasks neccessary to run a cinema, together with our half a dozen employees. Anyone is welcome to join the movement by simply attending one of our meetings for introducing new members. In our three screening halls of different sizes, movies are screened every evening all seven days of the week. Besides the main repertoire there are several initiatives and film series arranged by our members, with certain specific themes or with different events linked to the screenings. Our repertoire is also very much mirroring the general Folkets Bio vision of screening films from all over the world, from all different cultures, in all different languages. 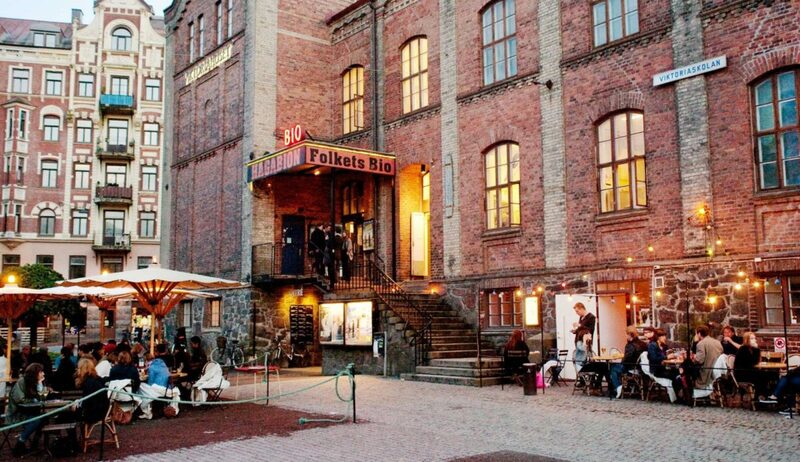 There are also two smaller cinemas not to forget, associated to the same Gothenburg section of Folkets Bio: the lovely ​Aftonstjärnan ​on the other side of the river, at Lindholmen, and ​Angereds Bio​ in the eastern parts of Gothenburg. To find movies in English, click a movie, scroll down past the trailer (if any) and look for ”engelska” in the row ”Språk tal” (speech) or ”Språk text” (subtitles).